We understand the extreme amount of trust our vendors and landlords put in us to do a good job and to sell or rent their property. We respect this trust and in return provide a first class service to both vendors, landlords and potential buyers or tenants. We understand that we need to provide our vendors and landlords with a complete package and to continually innovate. We work as a team, helping each other and therefore providing a good, quality service to the public. Due to this we are high achievers but we are always open to comments and suggestions on how we could improve our service further. Please take a few moments of your time to read through the rest of our pledge and see just how much Rule And Rule can offer you. Our office is located in Broadway, Sheerness with a prominent location. 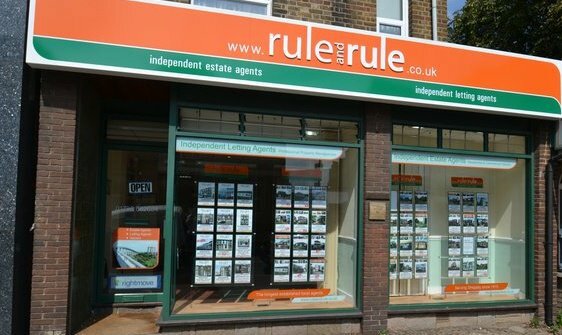 We have a large window frontage with spotlights, where you will find your property advertised in full colour. A lot of interest and enquiries come from our window display and we endeavour to keep it updated and regularly revised. Our office is friendly, welcoming and spacious. The office is open six days a week, which enables us to register more potential buyers and tenants. We employ experienced weekend staff and therefore can always offer consistency in our service. Once instructions have been received we will prepare all the necessary documents to market your property as soon as possible. We will immediately prepare accurate sales/rental particulars complete with professional digital photographs and a floor plan which will be sent to you for your approval and/or amendments. HIPs are history….Long live EPCs!! 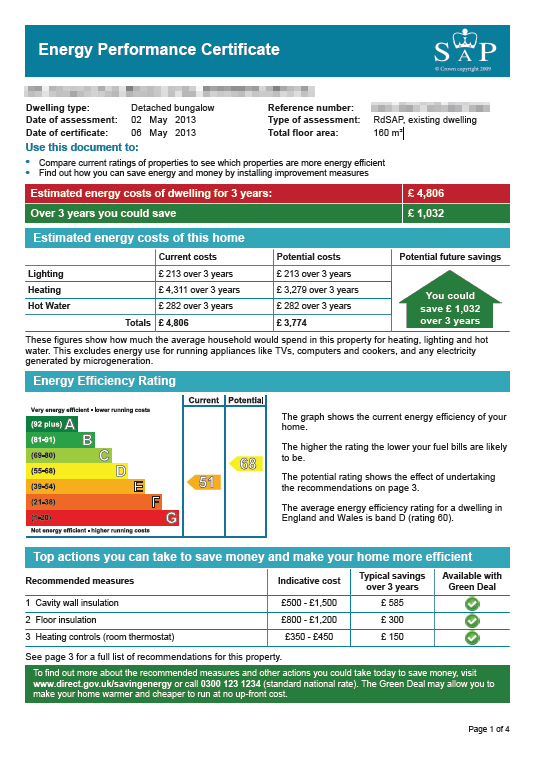 Immediately you decide to put your house on the market, Rule & Rule can instruct a locally established Domestic Energy Assessor to prepare an Energy Performance Certificate (E.P.C) on your behalf. You can of course arrange this yourself but remember, it HAS to be commissioned before we start marketing. Contact us for further information. One of the best ways of gaining interest in your property is with one of our very distinctive 'For Sale' or 'To Let' boards. It advertises your property 24 hours a day. A 'For Sale' or 'To Let' board generates a considerable amount of enquiries and enables potential buyers or tenants to locate your property with ease when viewing. We strongly recommend that you display a board, however, we would never erect a board without your permission. 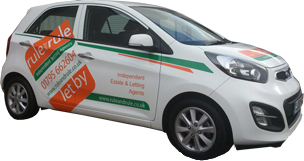 We will advertise your property regularly in our advert in the Sheerness Times Guardian newspaper. We obtain as much colour advertising as possible. 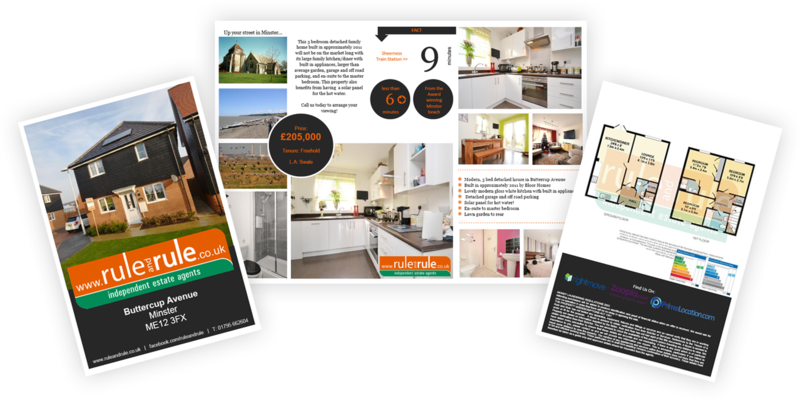 A lot of time and effort goes into our advert, and our new, revised, 'easy to read' advert generates a lot of enquiries from potential buyers and tenants. We will also advertise your property on the Internet with amongst others, Rightmove.co.uk the country’s biggest property portal, and Zoopla.co.uk which will put your home in front of even more potential purchasers world wide. Together with telephone ring rounds, SMS text outs and window advertising, we offer the complete package. 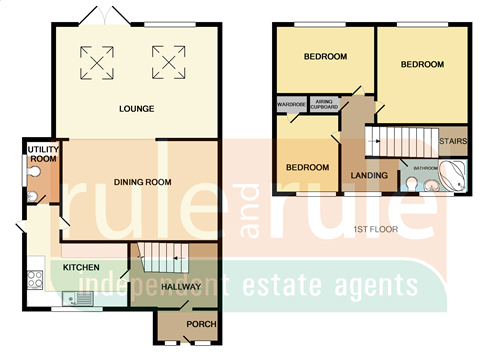 We will try to include a quality floor plan on every set of property details where possible. This is a huge advantage over a number of local agents that still do not provide this necessary information. We have had a great deal of positive feedback since their introduction and we will continue to provide them and also invest in new ways of displaying your property to its fullest potential. We provide a personal and professional service to individual applicants, phoning out on every new instruction and keeping them up to date with existing properties on our books. We pride ourselves in our regular contact with our clients; this in itself enables us to build a better picture of each applicant's needs. These contacts lead us to being able to match individual clients to individual houses. Every new property is sent to all potential buyers or tenants on the same day, and every applicant is phoned once the details have arrived to gain their thoughts on the property. When a potential buyer or tenant requests an viewing of your property, we will arrange a suitable appointment time with yourself and then send each party a SMS with the time and address. Our Negotiator can accompany the potential buyer or tenant around the property and give a guided tour, pointing out important points and features of the property. This also takes the emphasis away from you and allows us to gain applicant feedback promptly and answer any specific queries as they occur. If the property is vacant, or you are not available during the day, it would be helpful if you could provide us with a spare key, which will be placed in our secure key tagging system. If we do hold a key, we will pay you the courtesy of contacting you prior to carrying out the viewing as a matter of course. Customer Contact is a very important service we provide to our vendors and landlords. After every viewing we will contact the potential buyers or tenant and gain their thoughts on your property. We will then telephone you to update you on the progress of selling or letting your house. Throughout the whole process we will keep in touch with you at all times, providing help and guidance. It is our policy that every person that offers on a property is financially checked out prior to the offer being put forward to the owner. We will also confirm to you details of the prospective purchaser's ability to proceed and any mortgage arrangements.We will discuss the offer with you and provide you with advice and guidance. We fulfil our pledge to you making sure that we will sell your property at the best possible price. We are not stereotypical 'Estate Agents' and never have been; we provide a friendly, professional service at all times. People are comfortable dealing with us, which has lead to many recommendations from previous sellers to their friends and colleagues.